CNG: eAuction 431. Drusus. Caesar, AD 19-23. Æ As (27mm, 9.88 g, 1h). Rome mint. Struck under Tiberius, AD 22-23. 431, Lot: 348. Estimate $150. Drusus. Caesar, AD 19-23. Æ As (27mm, 9.88 g, 1h). Rome mint. Struck under Tiberius, AD 22-23. 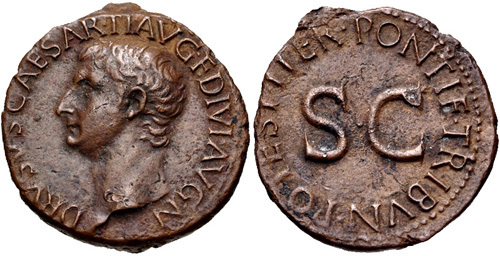 Bare head left / Legend around large S • C. RIC I 45 (Tiberius). VF, brown patina. Ex W. F. Stoecklin Collection (Part III, Obolos 9, 25 March 2018), lot 156, acquired from Leu prior to 1975; Geheimrat von Kaufmann (Hamburger, 27 May 1929), lot 723.